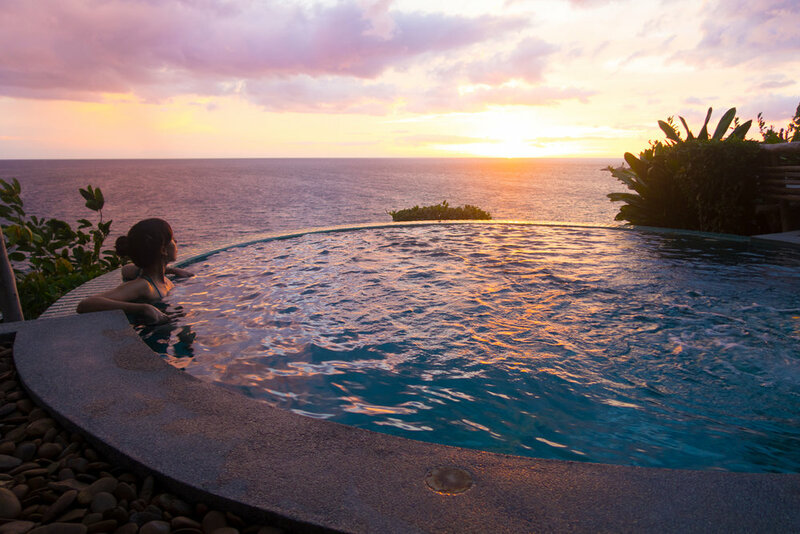 Koh Tao has everything you desire - and more! Although a small island (no longer than 3 miles from north to south), it has an abundance of adventures to enjoy. 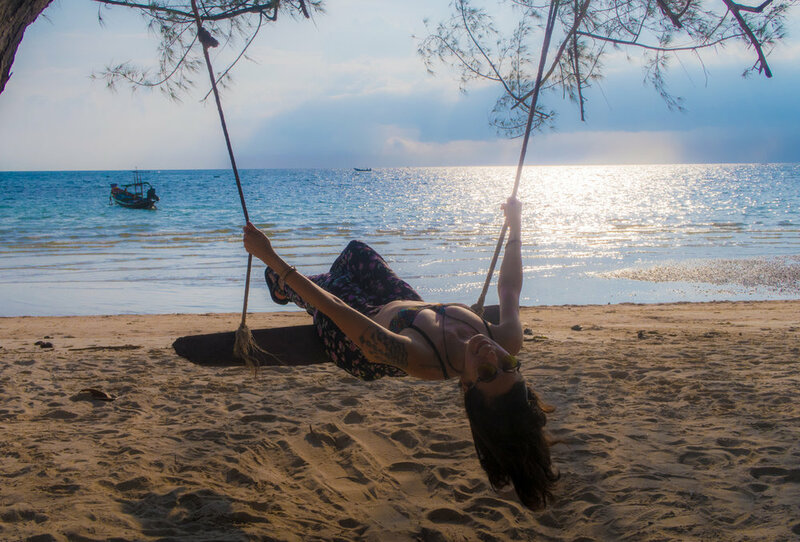 Beautiful beaches, epic views, hiking, snorkeling / diving, getting your PADI, peaceful spaces, delicious food, nightlife, yoga, massages for dirt cheap, and more. This was my personal favorite destination of ours in Thailand yet! Allow me to explain why..
Koh Tao is said to be one of the places where it rains least so even though we were there during the "rainy season", we were pleased to enjoy mostly sunny days! In fact, I believe we were fortunate to be there during the rainy season as it's also a slower time for tourism which means less people, and better prices. With it being such a small island, I imagine it to be crowded and hectic during the high season. Almost too hectic to truly enjoy it (unless that's what you're interested in of course). Which leads me to why you should come here in the first place. 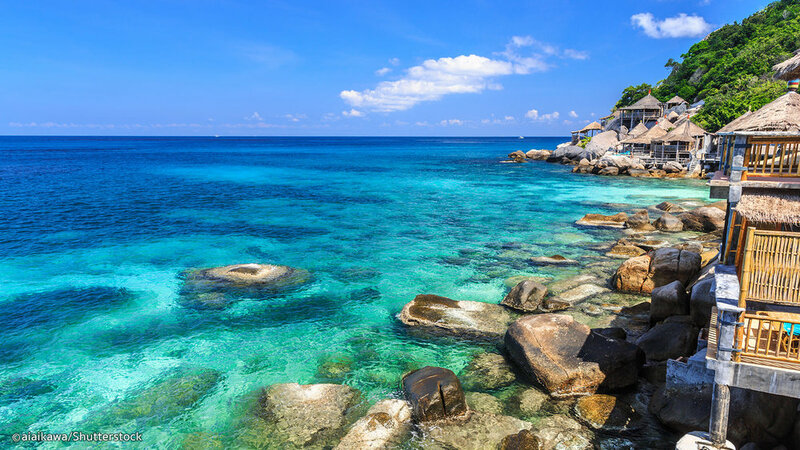 A nearby island just 15 minutes away, Koh Nang Yuan has mixed reviews, but we loved it! Here’s what you should know: it’s a small connection of islands adjacent to Koh Tao. It's privately owned and therefore has some enforced “rules” that some may not appreciate. 3) You can not lay your towel on the sand. The reasoning for these “rules” is said to be environmental which personally I support, however, I was very disappointed to see that there were plastic bottles thrown all around the island, along with many glass bottles from their bar with straws galore! Straws are one of the least environmentally friendly items and especially near the ocean they can be extremely harmful to marine life so quite frankly I didn't buy into their environmental friendly crap. This line of bottles shown above could've been there for who knows how long. Now that we got that out of the way though - let me fill you in on the greatness of this place. My best advice is to plan ahead and wake up early for this adventure! Make sure to hydrate well the night before and morning of since you cant bring your own water and it can be pricey there. Have a heavy breakfast to keep you full through the afternoon and hide some snacks in a bag (we brought protein bars). We planned a long-tail boat ride the day before and requested that we leave as early as possible. The island opens up to visitors at 10AM so we made sure we would be there just in time (I recommend being there a little earlier even - 9:45 if you can). After all, there’s an epic viewpoint that awaits! By being one of the first ones there, we were able to climb up to the viewpoint and enjoy a few minutes of taking pictures before the crowds rolled in. You see, every day there are tons of tour groups that visit here. When you book a group tour, you end up coming with ALL these other people simultaneously. That’s why we coordinated our own long tail which was easy and inexpensive! We roamed around the nearby hotels on Koh Tao to see who could help us arrange a personal long tail boat which is when we found Palm Leaf Resort who only charged $9/person - a great deal!! Another bonus, I got to pay it with a credit card! May sound silly, but using a credit card for purchases is a huge convenience that helps me to travel. I get to save cash for other purchases and collect rewards through my card - overall a win win! More on that another time though.. Remember that epic viewpoint I've been talking about? Well, this is it..
My tip is to enjoy the viewpoint FIRST and then make your way down for snorkeling! There are beach chairs for rental on the island but honestly Giancarlo and I just found a rock to hide our things behind and were in the water the rest of our time there. 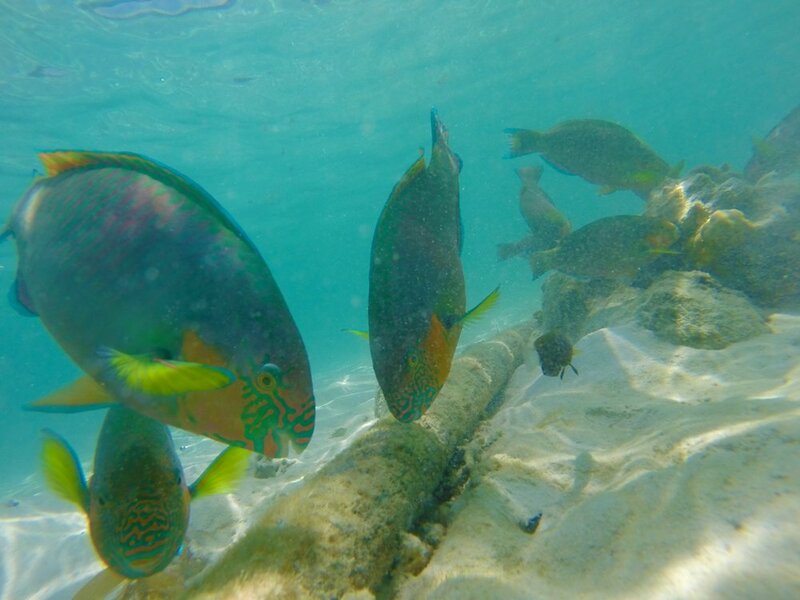 The water is beautiful hues of blue and I saw one of my favorite childhood fish - the rainbow fish! Who else remembers that book? Haha. It felt like a childhood memory coming to life. We scheduled our long tail boat back to Koh Tao for 2:30 which we followed up with lunch immediately after. Are you tired of the idea of amazing views yet? Yeah, me either! The John Suwan Viewpoint is another top activity to enjoy in Koh Tao. Near the south end of the island, this is another place recommended to visit early or towards the end of the day to avoid extreme heat. There’s a small fee of 50 baht to enter, but it is totally worth it. Be sure to wear good hiking shoes and bring water! The hike can be a little challenging but they've done a good job of placing ropes to help you along the way. Hiking back down is equally as much of an adventure! We took more time to enjoy the views of the path and take pictures. Honestly I don't think the pictures truly do it’s beauty justice. Around the way is also Freedom Beach which is highly spoken of but personally we weren't all that impressed. Do look into though and form a judgement of your own if you’re going to be in that area. Around Koh Tao there are 23 beaches but this is one of the main ones and the longest. Along it’s stretch are a variety of businesses such as restaurants and massage / wax spas for crazy cheap prices. My advice, take advantage!! Although traveling is said to be a vacation, it can still be strenuous on our body and mind - dedicate time to take care of you and treat-yo-self! Sairee Beach is also a great place to enjoy the sunset. Find one of the several swings along the shore and fly! Arriving in Koh Tao can be a little overwhelming. There are taxi drivers and other businesses bombarding everyone fresh off the ferries at Mae Haad Pier, the main entrance and exit of the island. I stayed behind with our bags as Giancarlo ventured to find the pick up service from our hotel. Travel Tip: A lot of Thailand hotels will offer some form of free pick up - make sure to email them at least 24 hours before your arrival so it can be arranged. When Giancarlo returned, he directed us left from the pier over to a central meeting area where most of the car services seem to be. Along the path there were countless vendors of fruit, smoothies, other foods, tour companies, etc. This is basically one of the main areas of Koh Tao. Once we were all together, the taxi brought us to our first hotel. Although the room was small with only a bed and a TV we never used, had no door to the bathroom, no curtain for the shower, no bath amenities, the view in itself was worth it! Now I should also mention, since this is literally a hillside resort (not only named one), it is an up and down hill journey to and from your room so I would really only recommend this hotel to people who are physically active and enjoy the outdoors. It felt like a workout at times but Giancarlo and I loved it nonetheless. For the 2nd half of our time in Koh Tao, we merged over to View Point Resort. A divine mix of nature and luxury, View Point Resort set a strong example of what I one day envision as home goals! You can tell they put a lot of attention into the details and arranged each villa beautifully. If you’re going to stay here - splurge on a pool villa! They provide ocean views and are each uniquely epic! Each morning we were served breakfast on the balcony which is free when you are in a pool villa. It was amazing to enjoy breakfast and the incredible view all at once. View Point Resort is very romantic but could also easily be enjoyed amongst a group of friends as well. Taxis are expensive here and usually have a set price so there is no bargaining. This is probably one of the easier and safer places to ride a motorbike as long as you are being responsible and staying aware. In fact, Koh Tao is one of the few places I would even recommend renting a motorbike out of all the places we visited. (Also keep in mind that this recommendation stands for the slow season - busy season could be a different story). As you may know, Thailand is infamous for bike accidents, especially amongst tourists. We rode with precaution and always wore our helmets. The other component to be aware of is scams when renting a bike. NEVER give someone your passport as security! That is the ultimate pass to get screwed over by these companies. We were lucky to find a guy renting bikes for just 200 baht ($6 US) a day and only requiring our drivers license as a deposit. He was just north of the Hillside Resort on the east side. On the other side of the island, it was a little different for some reason. While staying at View Point Resort, we were closer to Chalok Baan Bay, where renting a bike is a bit more expensive. We walked all up and down the Chalok Baan area inquiring about scooter rentals and felt best about a place called Buddha View Travel. Other places were asking for ridiculous amounts of money as a deposit or our passports so beware. The owner told us straight up that if we were looking for cheap, this wasn't the place - but if we were interested in insurance and peace of mind - then it's the right place. 24 hour rental costs 300-350 baht, and he accepts a 2000 baht deposit which is much less than the 6-8000 that other places requested. You can read more reviews about it here. I’ve been holding out on you guys. I have yet to mention about the amazingly delicious food that is here on Koh Tao!!! I’m talking some of our favorite from all of Thailand! Our absolute favorite! I mean, just look at this decadent smoothie and all of the vibrant life in these bowls! I’m not going to front, we came back here multiple times! It was our go-to for feel good food and a nice atmosphere too. Maybe a little overrated, but I enjoyed a much needed green juice and fruit bowl here. Grabbed some of their scrumptious snack bars to go also. Funny story, as we circled around town looking for a restaurant that we never found - we came across this joint. I was stoked to find they have a veg section in their menu! The food was really good and flavorful! If you like indian food - definitely check this place out! Also, bonus - on Sundays the veg dishes are discounted :) and that just so happened to be when we went. It’s not the South Beach I’m used to as a south Floridian, but it definitely had a feel good vibe. This was on the south side so we only ate here when we were staying at Viewpoint Resort. Right next to it is I Love Salad, which we didn't experience but heard good things about so if you’re in that area, consider checking that out too. Let me just say, if you’ve read all this way.. I love you beyond words!! Koh Tao is truly a special place. As you read, you can adventure around or just relax and soak in all the natural beauty. If you have any specific questions, feel free to leave them in the comments or in general let me know what you think. Is this somewhere you’d like to visit?! With love and gratitude… until next time. The next part of our journey brings us to Chiang Mai - the largest city in Northern Thailand. Chiang Mai was once ranked 24 of 25 Best Destinations in the World (According to Trip Advisor). The sky lanterns released are believed to help rid troubles and have attracted the attention of people worldwide for its overall beauty. Even if you're not here for the Lantern Festival, there's still plenty to do. About a 1 hour airplane ride from Bangkok, and you've arrived. The main area is a square (literally) where you can find restaurants, local businesses, souvenir shops, hostels / hotels, massage centers, and more. Fairly easy to navigate, you have a wide selection of things you can do and see. A trip to Chiang Mai wouldn't be complete without visiting at least one of the temples. We're here during the rainy season and as a result it rained quite often while we were in Chiang Mai which made it difficult to visit multiple temples as planned. However we did visit one of the main ones, Wat Chedi Luang, and enjoyed its architecture, beauty, and energy. Around the corner we were able to have a conversation with a young monk. Monk chats are available here to the curious daily from 9am to 6pm. We asked him questions such as, "What do you do for fun? ", "What inspired you to walk the path of a monk? ", and will be posting a video with his answers soon. He was a very nice gentleman who was happy to spend time answering our questions. We asked how he makes money and he mentioned that many monks live off donations from tourists and local businesses such as restaurants. We attempted to give him a donation ourselves but he declined stating he can only accept donations in the mornings from a temple. Fun Fact we learned: There are City Monks and Forest Monks and they actually have their own forms of social media! We found it quite interesting to see how they are a part of every day society but also dedicated to the many "rules" that are followed as a monk. This was not an original part of our plans but one day as we were riding the Songthaew (bus taxi service of Chiang Mai), Giancarlo and I met two other young travelers. One of them - a wedding photographer based out of Mexico - told Giancarlo about a place called Grand Canyon. We looked it up and Giancarlo was psyched. I however was nearly mortified (lol). Basically it is a man-made pool between mountainous canyons where people go to jump and swim. Having a fear of heights, I wasn't exactly thrilled, but Giancarlo lives for that type of stuff and I know that every time we push ourselves past our comfort zones – it leads to a good experience. We checked the weather and were happy to see that a sunny day finally awaited us! We woke up early, hopped in an Uber and traveled over (Yep, they have Uber here - but more on that later). It was about a 30 minute ride and my heart was racing as we approached the area. My mind kept replaying scenes of people jumping off cliffs and I questioned if I was ready. With Giancarlo's encouragement, we went inside and my mind was eased to see that the Grand Canyon had been renovated to be much safer with railing along the canyons and lifeguards by the jumping site. The highest point had been closed off due to accidents (I suppose) and while this other point is still high, it at least seemed manageable to me, haha. Giancarlo jumped first and screamed on the way down. Then it was my turn. I knew if I was going to make the jump - I'd have to just go for it. No looking down or around. So I walked away from the ledge and got ready to run. Without actually seeing how high I'd be jumping from, I ran towards the water and once I met the edge of the canyon, my eyes opened so wide you could probably see them from down below. I belt out an, "Oh shittt" as I fell towards the water and thought, what did I just get myself into?! Of course that feeling subsides once you hit the water and realize you survived. The biggest hurdle - getting over the fears in your mind. One girl waited at the top going back and forth about jumping for nearly 20 minutes and I didn't blame her. For the adrenaline junkies, don't miss this place! And even for the fearful, come overcome the limits of your mind. More than likely, you'll be glad you took the leap. Overall we ended up spending nearly half the day here having a blast, talking with others from all around the world, and enjoying a day in the midst of nature under the warm sun. The Grand Canyon of Chiang Mai is truly quite the gem! While in Bangkok, you could depend on the low prices of a meter taxi, but things are a little different here in Chiang Mai. The local taxis are called Songthaews and they are actually flat bed trucks with a covered sitting area that turns it into a mini bus / taxi. They travel along the main roads and can be flagged down, dropping people off usually in the order that they hopped on. As a tourist, you can show them your destination on Google maps or have them look it up on theirs. Prices for this bus taxi service vary with the lowest being about 30 baht per person. You can try to negotiate a price, but if it's a certain distance and you're not willing to pay the price - they won't be shy to kindly tell you no and drive away. Our hotel was a bit out of the way from the main area so after having to hop on a motorbike with an employee two times to then get to the main road where we could catch a taxi, we looked into Uber. Viola! Uber is actually the best way we found to get around Chiang Mai as it picks you up right at your hotel and brings you to your destination without making other stops along the way. Also it provides the luxury of A/C which Songthaews do not and can simply be charged to your credit card for a ridiculously low price! They do have surge times during rush hours (Uber's doing) so make sure to check the estimated cost first. There is A LOT of traffic in Chiang Mai, especially along the main roads. For this reason and others, we wouldn't recommend renting a motorbike here. Although it can seem like the cheap and convenient option, Chiang Mai is one of the more dangerous places to ride a motorbike. We saw several people with "Thailand Tattoos" aka scars from accidents and also heard stories of people in the hospital so beware. Uber is definitely our recommended form of transportation here. Another bonus is that many of the drivers actually speak English (somewhat rare in regards to locals here - few and far between) so you can interact with them along the way which makes for an even more enjoyable ride. This park is not exactly in Chiang Mai, however it is worthy of the trip while you’re in the area. To go here we rented a car for the day through Sixt for just $16 (although we ended up paying $30 for gas so be aware, it adds up). What you get to see in return are lush green landscapes such as this and more. Another intriguing aspect of Doi Inthanon is that it is base to the highest point in all of Thailand. We walked through clouds at different points throughout the park which was an amazing feeling. It’s at least a day full of adventure as you can hike, see waterfalls, and their King and Queen pagodas. We were bummed to have missed seeing the pagodas first hand since they closed at 5PM. We did our hike first and then planned on seeing the Pagodas on our way out of the park so be sure to go early. Also keep in mind that the last time for the hike is 3/4PM. During the busy season, they also have a Karen Village Market open, but again, being here during the rainy season – we ended up being one of the very few people in the entire park and as a result the market wasn’t open. Nonetheless we loved all the natural beauty and opportunity to escape the busy city life of Chiang Mai. I felt like this was the first place I breathed truly clean air which was glorious. Chiang Mai is FULL of great places to eat! My favorite restaurant there was Imm Aim which means happiness – and that is exactly what it brought us. Imm Aim is committed to eco-friendliness and had the freshest tasting food I’ve tried in all of Thailand. No straws are given (yay), he sources from local organic farmers, and has a free purified water refill station to help promote the use of reusable bottles. I would like to note though that this may not be a good restaurant for people who are used to eating processed foods. Because it is a healthier type of restaurant, they do not use oil to cook and therefore the food can taste a little "bland" to some. Personally, I don't enjoy many fried foods or dishes cooked in oil so to me it was perfect. If you go, enjoy a smoothie with coco milk and try any dish with their homemade hummus! Other great restaurants we tried in the area were Amrita’s Garden, Salad Concept, and Taste from Heaven (Giancarlo's favorite - see dish below ;p ). We stayed at Get Zleep while they had a great promotion running on Hotels.com for just $11/night. However, this may not be the place for everyone. If you want to be in the center of the city and action, I’d recommend looking into other options. But if you’re interested in a cozy space for a great price – this is your place! It was right next to a University which was neat as we were in the mix with students and received an authentic glimpse into their life and culture. Chiang Mai was a great way to see northern Thailand. If you go, I'd also recommend looking into the city of Pai which is nearby. Although we didn't go ourselves, fellow travelers had a lot of positive feedback to share, making it a location we hope to visit someday. I'm a big believer in treating yourself (and others). 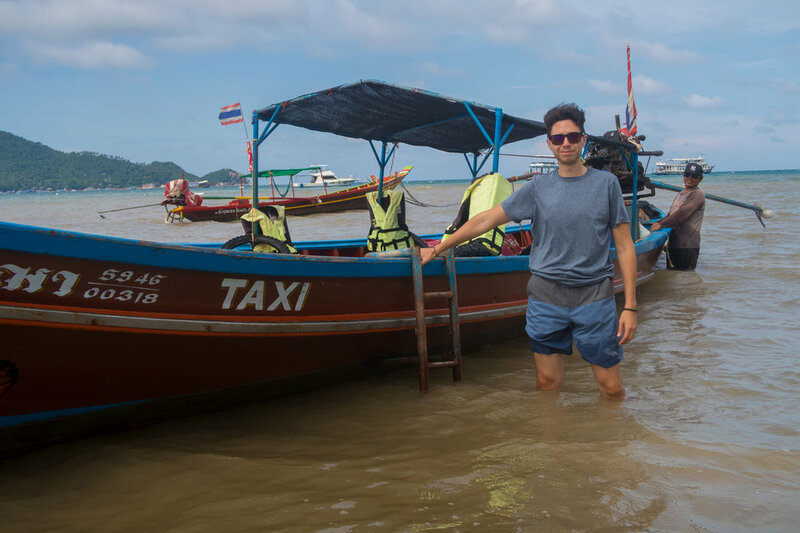 When my partner Giancarlo and I planned our 40+ day trip around Thailand, we knew we wanted to splurge in at least one of the locations. We figured Krabi, a southwestern beach town, would be a good place and that's when we came across Pimann Buri Luxury Villas. Exclusive with your own private pool, this villa is an apartment that you will want to call home. The overall atmosphere here is so comfortable - we could have stayed forever! Let me start from the beginning to explain why.. Prior to our arrival, a pickup was arranged as is for every guest. A luxury van pulled up and a nice man greeted us and brought us to the private villa. Awaiting us there was another member of their friendly staff for check in. Check in here was a bit different than anywhere we’ve ever experienced. They actually went through the check in process with us inside our villa rather than at a lobby or front desk. The gentleman gave us a warm welcome and collected our necessary paperwork, then proceeded to tell us about the property, breakfast options, and handed us our favorite menu - choices for floaties to enjoy in the private pool. From the moment we drove through the gate, our excitement was soaring about this luxury villa so once we were alone, we took the time to take a good look around. Of course, we started our exploration with one of the best appliances in any dwelling.. The fridge. Inside were fruits, water bottles, and juices - all complimentary. Along the shelf were other snacks (albeit not the healthiest but we were happy to find a can of cashews) and a fully stocked kitchen with more appliances than we even have in our own home. Once we were ready to head back from our daily adventure, we called our friends at Pimann Buri and within minutes they were there to pick us up. When we returned Giancarlo and I were amazed by what we saw..
A sky full of stars! Unlike anywhere that we had seen in Thailand! I suppose since Pimann Buri is a little away from most of the light pollution, it allowed the stars to shine. To enjoy this cosmic bliss, we got on the floaties and stared up from the comfort of the private pool. We didn't have to worry about if we were within pool hours, or making too much noise as we basked in the beauty of nature's light show. We could just be. Float. Relax. And enjoy each other's company. Another little surprise awaited us once we got out of the pool. Waiting for us at the door was a small cat just sitting, looking like she wanted to be let inside. Being the animal lover that I am, I spent a few minutes petting and cuddling with her. For an outdoor cat, she was actually one of the friendliest cats I've encountered. She was affectionate, loved the attention, and purred her way into my heart. Her presence really added to the homey feeling of the property. The next morning we awoke to the arrival of breakfast at our door. In came 2 chefs to serve us and they even toasted the bread there in the villa for ultimate freshness. It was a nice spread with more food than we could actually eat ourselves. For vegans like myself, they served salad and a decent amount of fruit which I paired with oatmeal I had bought previously. As for being without dietary specifications, options were bountiful with fresh toast, pancakes, and pastries. Dedication to eco-friendliness is vital to me in every day life and something I do not forget nor neglect as I am traveling which is why it's worthy to me to support places that understand the importance of each playing our part. Pimann Buri helps by using environmentally friendly cleaning products, natural pest control, low-energy LED and fluorescent light bulbs. 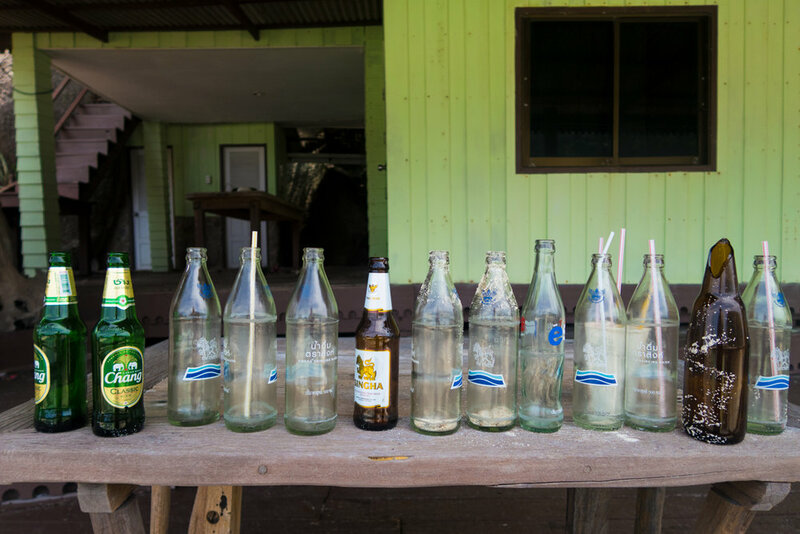 In addition they recycle all bottles, cans, and office paper which many of the smaller resort properties unfortunately do not. I also appreciated that they are committed to providing the best work place environment, benefits, and salary to their employees. After learning what the average pay is in Thailand (a small amount), it was nice to hear that spaces such as this do what they can to offer great opportunities. The staff here was truly amazing and catered to our every desire. They even washed the dishes after breakfast. We were very appreciative of their time and energy. When traveling the world, let's not forget about the people who help us along the way. :) We left what we had in cash as a tip for the staff and hope that others feel inspired to do similarly even though it seems to be a fading tradition. I'm curious.. do you still tip when leaving a hotel or place of stay? No judgement, I honestly don't for every place I stay. It depends on length of stay and interaction with the staff (i.e. did they clean the room during our time there, bring room service, or other). So I'm just wondering if leaving a tip is still considered customary. This villa truly has everything someone could want and need. If coming to Krabi and you're interested in staying here, I would even recommend setting aside an entire day to relax here and fully enjoy everything it has to offer. Showers and bath tubs (bubble bath anyone? ), the pool of course, their own restaurant which has a pool table for your gaming pleasure, or lay back in your own living room which has a TV and DVD player for rainy days / chilled out nights. Needless to say, it was difficult to leave this lap of luxury and we would highly recommend Pimann Buri as a place of stay when in the Krabi / Aonang area. I’ve long heard of Bangkok but wasn’t really sure when I would end up there myself. When my partner and I decided to take a leap of faith and coordinate a 1-month journey throughout Thailand – the vision became a reality. Notorious for it’s feature in movies such as the Hangover 2, Bangkok has a reputation of crazy night life, chaos, and even crime. In reality, nearly any place has those aspects of life.. especially if you go looking for them. What we experienced however was far from that widespread perception that movies and TV shows depict. What you focus on expands, and what we chose to focus on were historical sites and good food. The abundance of fruits, food, and more was a party for the senses. I was elated to find durian, one of my favorite fruits for its cancer fighting properties and other benefits! Normally very pricey in the states, I enjoyed a large chunk for 100 baht ($3 US dollars). The fruit indulgence didn’t end there – dragon fruit, another normally pricey favorite, was only 50 baht (about $1.50 US). Basically, I found fruit heaven! We walked around and observed the environment – soaking in the Thai culture and energy. The floating market seemed to be a popular place for families to come and enjoy the day. A lot of people bought bread and other foods to feed the fish which made for an entertaining feeding frenzy. Of course, we had to get on to the “floating” part of the market so we hired a long tail boat for 150 baht/pp ($4). It took us not only along the market, but through the floating village as well where we received a glance of how people live along the river. The ride lasted a little more than 30 minutes and took us further than we expected – very much worth it in our opinion. We had originally planned to see two floating markets that day but we enjoyed ourselves so much at this first one that we ended up just spending all the time there until our next destination. A trip to Bangkok is not complete without a visit to the Grand Palace. It certainly lives up to its name, with awe-inspiring architecture and divine craftsmanship. Pictures really don't do it justice. Although the name gives off the idea of being one large building, the Grand Palace is in fact a collection of buildings along the highly visited property so make sure that you allow yourself enough time to fully explore. I’d recommend at least 2 hours. We didn’t get a guide but my thought would be that it’s probably worth it. (Note: Entrance fee is 500 baht ($15 US) and can only be paid in cash.) Once we were inside we were almost overwhelmed by how much there was to see. We set our focus towards the Emerald Buddha, where pictures aren’t aloud but it’s truly a site to see. It is a statue of the meditating Buddha seated in a yogic posture, made of a semi-precious green stone, clothed in gold. By the time we arrived here, it was about 2PM, very hot – and after recording video and taking pictures, we realized it was nearly 4PM and time for us to head over to the site of the Reclining Buddha before it closes at 5PM. Note: Proper dress code is strictly enforced at the temples for women AND men. Your shoulders, knees, and ankles must be covered out of respect. If you’re not wearing the proper attire at the time, I wouldn’t worry too much as there are many stores outside of and within The Grand Palace that sell long pants / skirts for only 100 baht ($3). They had a light feel which makes them much more comfortable to be wearing in the heat rather than jeans or even yoga pants. Pronounced Wat Po – This temple is the site of the famous Reclining Buddha. It felt like a dream come true to see this in person! Costing only 100 baht to visit, this is worth every penny and only just down the street from The Grand Palace so don’t miss out! From there, we rushed back to our hotel to take quick showers and attempt to catch the sunset from a rooftop in Bangkok. We chose Octave, a lounge on the 45th floor within the Marriot. The rooftop view is 3 stories and offers a 360° view of Bangkok. Although it was a cloudy day and we didn’t quite make it in time for the sunset, we loved it nonetheless! Definitely make it to one of the rooftops to see the city light up at night. While yes, the roads are busy, that only makes sense considering Bangkok is one of the most populated cities in the world and amplified by foreign travelers. Aside from that though, we didn’t find it to be anything beyond the ordinary. For those who don’t know, I live a vegan lifestyle and my partner is vegetarian so we do specifically search out restaurants that cater to our demographic. Please keep in mind though that the places I’m about to recommend can be enjoyed by anyone and everyone. If you don’t believe me – just check their reviews ;). On our first day we visited Suananda which is also a yoga studio and ayurvedic center. Out of all the places we ate, this was my favorite! We ordered spicy mushroom soup, green curry, the falafel salad, and pad thai – all of which were delicious!! For dessert, we topped it off with carrot cake and savored every bite. You could really taste the freshness of all the plates and although we left full, it wasn’t the type of full that leaves you ready for a food coma like other foods do. The next day we enjoyed breakfast at the Floating Market (a mix of fruits) and then ventured over to Mango by The Grand Palace for lunch. The inside is quaint and the portions are large! They have a massive menu so everyone is sure to be satisfied. The first thing that caught our eyes was their Kombucha selection! We ordered ginger and lemongrass to which a generous amount of each is served. No exaggeration when I say the ginger kombucha was the best I’ve ever tasted! For anyone who loves the kick – don’t miss this. Underestimating the portion sizes, we over-ordered a tempeh burger, more curry, and pad thai. (If you’re noticing a pad thai pattern – that’s alll my partner Giancarlo who is a fiend determined to try pad thai at every restaurant we visit). Seriously, order one thing here at a time and take it from there haha. For dinner we found ourselves at the highly recommended May Veggie which prides itself on being a place for even meat lovers. In that sense, it did not disappoint. It has a wide selection of vegan fish, chicken, and even bacon. I kept it simple with A48 (these references are cracking me up – but it’s what’s on the menu) Minced Tofu Stir Fried with Basil Leave. And just to give you an idea on cost – my dinner only cost me $4 US. Let’s just say we’re eating realll good around here ;p stay tuned for more restaurant recommendations! After 26+ hours of traveling across the globe from Florida – we were happy to have a hotel close to the airport. Great Residence Inn, was honestly far from living up to its name, but it sufficed for the night. I wouldn’t recommend it for anything beyond that. The room had mosquitos flying around, there was no shower curtain or anything to divide it as a shower as it was basically just a high faucet next to the toilet. I wrote more in length about it on TripAdvisor, but in summary – I wouldn’t recommend. The next morning we woke up and Giancarlo found iCheck Inn which felt like a tremendous upgrade! It was only $9 more than Great Residence and was like your own apartment with a shower door AND get this - a bathtub! Also, much safer setting with security on the grounds. We highly recommend! It wasn’t necessarily in the center of the city, but a taxi never cost us more than $3 to get around. Bringing me to the next topic. When researching and preparing for this trip – there really wasn’t a clear consensus on the best way to get around. Some people spoke of buses – but we rarely saw them or information on how to get to them. We experimented with Uber which can be a good way to go if you don’t want to spend cash on a ride but we found that it charges nearly double what a taxi would cost. Taxis in Thailand are insanely cheap! The meter starts at 35 baht (which is about .50 I think) and then goes up only 2 baht per km. Basically, a 30 minute taxi ride cost us an average of 160 baht (about $4 so we usually left a tip wondering how this is even a profitable business and how much the drivers themselves must get paid). Kind of off topic – but I really feel that when traveling to another country, you should try to leave it in better condition than when you arrived and that includes helping to support the people who live there. We are so blessed to be able to travel to the other side of the world. Yes, I’m on a budget – but at the same time, the last thing I want to do while I’m here is short-change the locals who are trying to supply for their family. Back to this main topic though, while most taxi drivers are hard working honest folks, there are some who may try to get one over on tourists. The best way to avoid this is when telling a taxi where you need to go, say meter to ensure they turn it on. If they refuse to use it, it’s often because they want to charge you more than what you would be paying for the ride. If they charge more than 200 baht to go somewhere within 30 minutes, don’t take that ride. Some drivers tried to charge us 500 baht ($15 dollars which is really pricey given Thailand prices). I’d rather use my money to go with a meter taxi and leave them a tip. OR maybe you find a taxi that will agree to a price that you know you’d be paying anyways, but doesn’t use the meter. In this case, as long as the price is fair – I’d say go for it. They probably just need the extra money for themselves. We’ve all been there. Another option is Tuk-Tuks. Without A/C this should generally cost you less than an actual taxi. Somewhat embarrassing but also comical is the story of our first (and so far only) Tuk Tuk ride. We had just left from having lunch at Mango nearby the Grand Palace and were excited to take a chance on a Tuk Tuk. The driver said 100 baht to the Grand Palace and we agreed but in retrospect, this is pretty high for what should’ve been just a 10 minute ride. Not to mention, when we got out we realized the driver brought us to the wrong place! We laughed as we realized he brought us to a museum that he probably receives a commission for. We were so caught in the moment of being in a Tuk Tuk that we didn’t pay attention to where we were actually going – a lesson learned. Tip of advice – when you’re in wifi, pull up where you need to go in Google maps. Most of the time it’ll stay active even once you’ve left the wifi area. This way, you can see which way you should be going and be sure that a driver isn’t taking you elsewhere. Just note that sometimes Google maps pulls up toll roads which a taxi generally won’t take because it cuts out of their profit so be aware of the alternative routes which are more likely. All in all, we enjoyed our time in Bangkok and were happy to be able to experience the ups and downs of the city. On our last day, we took a morning flight to Chiang Mai where we’re spending 5 days. More to come on this Thailand adventure! Thanks for reading and being a part of the journey.. It happened again! Another trip that provided a quantum leap towards personal evolution and spiritual revolution. This time, in Bali, Indonesia - commonly called - the Island of the Gods. I honestly would have never expected to find myself here and as a preface, this is not your average travel blog piece. This is for anyone interested in a personal and raw explanation of a travel experience. The adventure came about after an interesting turn of events. I had just returned to the states from spending 3 months in Costa Rica, flying through my savings account, taking on a new car loan, and quitting a job that although paid well, did not resonate with the quintessence of my being. I found myself without a place to live and even got caught up in a month’s work for employers that disappeared without paying their office rent, or employees. I began to feel hopeless and lost. How had I gotten myself in this situation? Feeling that I had nowhere left to turn, I reached out to an aunt who welcomed me into her home and showed me some of the most meaningful examples of family. During this time, she also encouraged me to re-examine my life and how I wanted to move forward. Reminding me that a job should not simply be something we do for money without emotional fulfillment. I needed to get in touch with my heart. Although damaged at the time, I realized that our hearts still have the power to show us the way. To reignite the connection, I would need to quiet the chaos of my exterior life, and really take a deep look within. These are amongst some of the questions I reflected upon. Moments in silence led me to my life saving passion.. Yoga. I love Yoga with every ounce of my existence, why not share this gift with others?! That was it, the answer became clear.. I would study to become a Registered Yoga Teacher! I researched Yoga Teacher Training programs that would allow me to truly immerse myself into the experience. Signs began appearing nearly immediately. I came across Santosha Yoga in which there was an upcoming training and possibility for scholarship. I applied and was miraculously granted part sponsorship! The next miracle, a kind soul who sponsored the rest of the YTT investment. It was clear, destiny was unfolding before my eyes in ways I would have never imagined. 3 flights and 42 hours of traveling to the other side of the world allowed me to time hop my way around the globe. Along the way, I began reading Eckhart Tolle’s - The Power of Now: A Guide to Spiritual Enlightenment. And that it was. Through this book, I began to realize that I allowed myself to be a victim in life. A victim of my thoughts, circumstances, and too often a victim to memories of the past and worries of the future. This truly is one of the most life-changing texts you can bless yourself with. Everyone’s reflections differ I’m sure, but the significance of it’s impact is the same. I arrived in Bali 3 days early so that I could travel freely before the Teacher Training. I stayed at hotels for unbelievable prices ($25/night for a nice bungalow), and enjoyed the city of Ubud - visiting the Monkey Forest, rice terraces, historical temples, and cultural explorations. The Balinese culture is so beautiful. Colorful, vivid, and full of gratitude. Every morning, they dedicate offerings of thanks for life which may include flowers, food, and other items. Coming from a place that is all about the hustle and status of your finances, it was beyond refreshing to see a culture give freely, more than they may even receive. The food is fresh, delicious, and inexpensive. $3 meals?! I was in Heaven! It came time to travel to Canggu where the YTT was being held at Villa Serenity. A beautiful environment which I would consider more of a hotel with a home-y feel. The night of my arrival I ate a light soup at a nearby restaurant and went to sleep early. I came down with Bali Belly. Never have I felt so sick in my life. I awoke in the middle of the night in excruciating pain, crawling to the bathroom, feeling alone and scared. I stayed awake feeling unwell for the next few hours until I saw the sun begin to rise. In hopes that there would be someone, anyone, that could help me.. I crawled my way to the Villa’s kitchen. Shaky and tired, I tried to explain that I was sick. Luckily, despite the language barrier, it was easy for them to understand that I needed help. Shortly after, the owner of the Villa came to my rescue. He gave me charcoal water to help detoxify whatever bacteria had infected my body and even was nice enough to give me a therapeutic stomach massage. After so many days of traveling and being in a foreign setting, getting sick was ironically the comfort that I needed. In retrospect, Bali Belly was a spiritual analogy for the cleansing of bacteria that had infected my life, because from that day, my entire perspective changed. Yoga Teacher Training provided me and many others with more than a certificate to teach a practice we love. It gifted us an opportunity to heal, to learn to live in the moment, and to dedicate time and energy to spiritual counseling with an amazing and caring soul. It was my awakening and rebirth! If you are looking to travel not only in destination, but in soul - Bali is an excellent space to do so. It’s nature and essence attracts like-minded people seeking the truest meanings of life and love. If you hear a similar calling in your heart.. Follow it. 1. You get outside of your comfort zone. You do need a travel Visa depending upon where you’re traveling from. I purchased mine at the airport upon arrival. Rice terraces are abundant so please save some time to stop at one, if not several. The temples are sacred and worth exploring with a group or guide whom you can find locally. Mount Batur offers hikes and although it is challenging, it is worth every bit of effort! Please wear comfortable athletic shoes. You will learn a lot about yourself on the way up and it's an incredible feeling to travel to such heights with others. Canggu has beautiful beaches and an eclectic community. Tanah Lot, one of Bali's beautiful beach temples (pictured above) is a great place to visit for the sunset. There are many restaurants and shopping in the area as well. Feel free to bargain with the shops but also keep in mind that this is how they make their living and feed their families. Most of your purchases will go towards their overall well-being. And lastly, my consistent recommendation - travel with an open mind and a loving heart. They are our ultimate compasses. I’d love to hear about your Bali / YTT experience or what you thought of mine! As soon as you enter Monteverde you can feel the difference of crisp-air and cooler temperatures. You’ve arrived at a nature lover’s paradise. Ultimate relaxation awaits you between the cloud forest trees with complimentary yoga classes, an organic juice bar, and an incredible dining experience with a divine view. These luxuries are only a portion of what you can expect during a stay at family owned and community focused - Hotel Belmar. Located in the heart of Monteverde, the Belmar property offers an array of sacred spaces for you and yours - making this by far one of the most beautiful hotels that I have ever seen! You can warm up in the jacuzzi, or head down to their garden and natural spring water lake - where along the way they have their own micro-brewery. Sidenote: I don’t drink, but even I was intrigued by their menu of flavors! Cheers mates! Then if you head uphill you will find their greenhouse garden where they nurture many organic herbs and plants, which they then share with you through their Farm to Table philosophy. The garden is also home to their composting efforts which are part of their highly admired sustainability efforts. 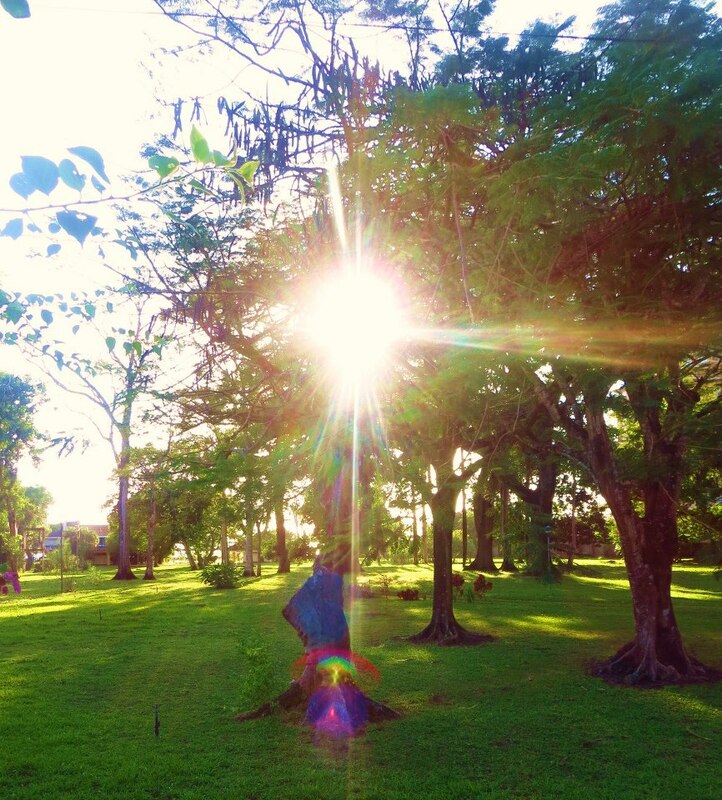 No matter where you may be on the property, you will undoubtedly pick up on the spiritual vibration of the hotel. To enhance their natural essence, they offer a morning and afternoon yoga class every day along with delectable organic superfood juices such as - the Green Extreme - a mix of pineapple, orange, banana, lemongrass, spirulina, turmeric, and celery. Can you say Power Smoothie?! If you enjoy more of a sweeter sensation, consider their Shaman smoothie - delicious banana, cacao, chia seeds, almond milk, goji berries, maca, cinnamon, and nutmeg. I’m drooling just thinking about these again! Not only did Hotel Belmar win my tastebuds over, but it also won the key to my heart. Literally, your hotel room key comes with a wooden heart (carved by their team as a cut-out of their fences). Nice touch Belmar, nice touch. Truly though, they also won my heart through their dedication to the environment and their community. If these aspects mean as much to you as they do to me, you are surely to appreciate the rest of what I have to share. Hotel Belmar is a leader in levels of sustainability. Through many of their innovative practices, they ensure countless Go Green / Conscious Living efforts such as the presence of solar panels, biodigesters, a greenhouse garden, compost, and recycling systems - just to name a few. These practices are a genuine reflection of the Belmar family’s respect for environment and community. To help share this love and awareness with members of their town, they host different events each month such as teaching how to compost, donation drives to collect school supplies for local children, and organizing a deforestation program where people can spend the afternoon planting trees. How sweet is all of this?! Also, the Mrs. of the Belmar family cofounded two schools in Monteverde expanding opportunities for education to the youth. It is details such as these that really help you to feel good about where you are staying and who you are supporting with your decision to do so. In return, they go above and beyond to make sure that all of their guests needs are met! You are welcomed at the door with a warm oil-infused towel along with fresh juice. One of their friendly staff members then gives you a brief introduction about the hotel and area. They can suggest tours which we appreciated as they led us to Curi Cancha Reserve, which we loved! Then they hand over that key to your heart... I mean, room ;) and guide you to the space you get to call home for your time of stay. They have a variety of room types each providing an incredible view! Inside your room you can find organic beauty products such as shampoo, conditioner, and body lotion made specifically for Belmar guests using sustainable materials and organic ingredients. Another very nice touch Belmar. Every detail from beginning to end of this hotel was immaculate. Monteverde became my favorite place during our stay in Costa Rica. If you are traveling to this wonderful destination, make sure to consider Hotel Belmar as your space of stay. You will be SO happy that you did! You wake up along the beach and can hear the waves crashing along the shore. The breeze brushes upon your sun-kissed skin as the palm trees sway. Morning yoga classes will have you finishing with a heart-felt Namaste. A getaway at Room2Board will certainly deliver more than you even bargain for. Listed as a hostel, it actually provides the ambiance of a hotel with the option of shared rooms for budget travelers, and private rooms for those desiring a more exclusive experience. It’s a newly constructed building which is very well maintained, with the cleanliest of rooms and bathrooms for your comfort. The 1st floor hosts their check-in area with an in-house restaurant and bar right by the pool so you can lounge and enjoy your favorite drinks and plates. Reggae music is often flowing out of the speakers to compliment the vibe of the beach side environment and you can also make special requests for music of your choice. At night, surf videos play on their big screen projector. Even if you don't surf, these videos are entertaining to say the least. Room2Board is a great place to connect with fellow travelers sharing stories, laughs, and great times. No exaggeration - the friendships I’ve made while staying here have lasted far beyond our time in Jaco. I stay connected to many of the people I met here still to this day. Besides making new friends, during the day you can sign up for surf lessons, walk along the beach, relax in the pool, explore the town, or enjoy an adventure on one of their many tours by going to see a nearby waterfall, riding horses, etc. This is especially my favorite place to stay in Jaco because of it’s location. You’ll be right along the beach and it’s just a few minutes walk into town. Also, on the way, you have to drive along a bridge that I call Crocodile Crossing. Stop here if you can and get out to see why! Pictures don't do it justice. In addition to all this fun, (and this is what I love most) when you stay at Room2Board - you are just a short walk away from a hike to a glorious sunset view point. Traveling up this nearby mountain, you’re likely to cross paths with mountain-bikers, runners, and others walking and journeying to this majestic view that allows you to see Jaco in a way that can’t be done anywhere else in town. Rumor has it that a restaurant was meant to be opened at the top, but funds ran out so now what’s left is pieces of it’s coliseum type architect. Fortunately for us, it makes for a divine space to enjoy the Pacific coast sunset. It’s about a 20 minute walk to the top view, and I consider it a MUST each time I’m in Jaco. Luckily, Room 2 Board is the closest stay to this point which makes it even more appealing to me. They also provide a communal kitchen with all the necessary utensils for people like myself who save funds by personally cooking most meals. Both the kitchen and in-house restaurant are fun atmospheres so you’re bound to have dining experiences that you will much enjoy. Just in case you want to venture out though, I also recommend Taco Bar or Namaste Cafe. Taco Bar offers an awesome salad / buffet and they have the option to sit on swings which I always find fun. When the sun begins to set, if you’re not interested in a hike, just head upstairs to Room 2 Board’s third floor where you can also enjoy a great view and hammocks setup for your relaxation. When I’m in Jaco, there is never a doubt that Room2Board is where I want to stay. Check out my video recap to see more of why. Sometimes your intuition directs you to a place you've never been, and although it can be intimidating to find yourself in a completely new environment.. Deep within, you can feel that this journey is a part of your divine destiny. At least that is how it has felt for me. When I went on my first solo trip as a 21 year old female, my head was filled by friends and family with, "What - ifs" and, "Do you know how dangerous that can be?" Despite the concerns, my heart had been called on a mission: and I was going to answer it! I had been working as an Administrative Assistant to the Pediatric Heart Transplant Program of my local Children's Hospital when I realized, I too needed to heal. My father passed away from cancer when I was 10 years old which was quite traumatic. Watching him undergo surgeries and chemotherapies only to deteriorate in front of our eyes was the most painful time of my life that I had not yet dedicated time towards truly transcending. So my intuition led me to research how I could do some soul searching. I came across a learning vacation at School of the World where I signed up initially for spanish classes.. But little did I know, that something much larger awaited me. Along with spanish classes, I decided to sign up for daily Yoga as well since I had heard so many great things about it. The intention had been solidified. I respectfully resigned from my job. I was set! A month in Costa Rica learning spanish and Yoga! I thought, I can immerse myself in the culture and return with new insight, plus being able to finally make my family proud by speaking spanish more fluently. Ha, well.. Let's just say that I still struggle with my spanish :x. BUT, I received the greatest gift that saved and changed my life forever.. and that gift is..
As far as the travel experience, School of the World has an amazing team of teachers and the facility is so comforting, I felt right at home. Offering not only spanish and Yoga classes, but surf lessons and photography as well, the school attracts people of diverse backgrounds from all around the globe. My desire for culture and global awareness was easily exceeded. I made friends with locals as well and have remained in close contact with the people I met along this journey years since. It's a deep connection that is shared when you meet people through travel. Such unique experiences that although the relationships may be short in time, are heart-warmingly fulfilling in spirit. Traveling alone, you learn more about yourself than you could ever imagine. You realize the strength and courage you possess, and it grows through each experience. During my time there, I volunteered at a local preschool teaching english, helped a missionary feed the homeless, climbed mountains and watched the sunset, made life-long friendships, cried, laughed until it hurt, wandered aimlessly, donated clothes, and fell in love..
With life and with myself. A feeling I had long lost. Yoga, Photography, Spanish, Surf, and more! PS: School of the World did not ask me to write about them, but I am personally so grateful for the experience I enjoyed there, that I feel inclined to share it with as many people as I can. If you're interested in a vacation that involves more than simply laying along the shores of a beautiful beach (although there's nothing wrong with that), I would highly recommend SOTW! It's a great way to meet and connect with new people while visiting another country. The classes are worth every penny. Plus, big bonus as a solo female traveler, I always felt safe and even at home during my time there. (I actually flew back 2 weeks later because I felt homesick once I got "home"). Have you been on a learning vacation before? I'd love to hear about your experience!